Wake County deserves a District Attorney who is experienced, fair and committed; focused upon the next generation, not merely the next election. John successfully tried his first jury trial in Federal Court after being in private practice for less than three months. He successfully argued his first case to the North Carolina Supreme Court in his third year of practice. 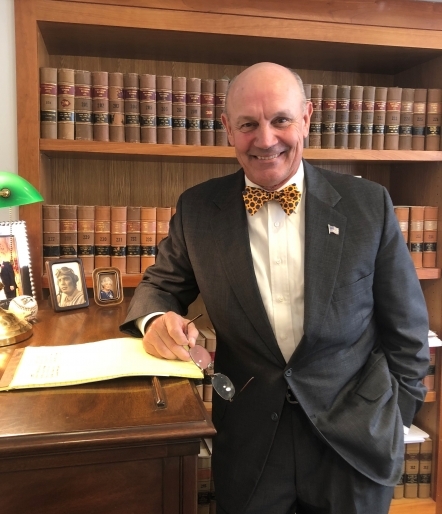 He has been a successful trial lawyer, a zealous advocate for his clients, and the owner and operator of a business for more than three decades. A native of Scotland Neck, N.C., John learned the value of hard work at an early age and earned his Eagle Scout when he was fourteen years old. He unexpectedly lost his forty-nine year old father to heart disease when he was only seventeen years old. John graduated from High School at Hargrave Military Academy and from undergraduate school at Wake Forest University. He supported himself through undergraduate school with summer employment on the farms around his home town and with athletic scholarships by playing sports all four years of his eligibility. He was named the Special Teams Captain of the football team his senior year. After graduation from Wake Forest University, John's first job was as an hourly employee, loading and driving trucks for a moving company. John later worked for a Medical Manufacturer in sales and as the Regional Sales Manager of the Southeastern United States and the Caribbean Basin, which job he held until he decided to return to law school at Wake Forest. Upon graduation from law school and passing the N.C. State Bar Examination, John served Judicial Clerkships for the U.S. District Court and the North Carolina Court of Appeals before entering private practice. Since entering private practice, John has both prosecuted and defended cases, trying well in excess of one hundred jury trials to verdict. He is licensed to practice before all courts in North Carolina, including all three Federal Districts, the Fourth Circuit Court of Appeals, and the U.S. Supreme Court. John has been successful in public industry and the legal field, managing people and money in both sectors. John is committed to Wake County and strives to make it a better place to live and work. He has been actively involved with Boy Scouts, the Tammy Lynn Center, and currently serves as a volunteer for the YMCA of the Triangle. He is passionate about young people in his community and serving his community's less fortunate citizens. John knows how to treat others and possesses the ability to determine what needs the most attention when, and how to be even handed, as circumstances warrant. He has always been and remains committed to helping our Wake County be better. You can connect with John by phone at (919) 832-3965 or email at JBRYANT@bryantivie.com. We are very proud to stand behind our men and women in all Law Enforcement. Wake County Law Enforcement Officers deserve a District Attorney who will fight for them. Law Enforcement personnel accept a special relationship with the citizens that they serve and with the office of the District Attorney. That special relationship requires open, fair and honest dealings which are uniformly transparent between the agencies and the citizens. This relationship is at its best when all three of these groups work together to ensure that the community is the best it can be. Our District Attorney has the unique responsibility of keeping our state government accountable to the people. Whoever holds that office should not tolerate corruption in our government nor should that person themselves use the office to either self-deal or advance their own political objectives at the expense of the citizens of Wake County. I'll fight back against anyone who unlawfully takes from the taxpayers or engages in self-dealing, regardless of their politics. I will work tirelessly not only to put unremorseful and irredeemable criminals behind bars, but also to find a better way to promote imaginative resolutions that better ensure a law abiding citizenry and fewer deprivations of liberty. I will work to ensure that those who break our laws pay for those crimes and to find alternate solutions to correct or enhance their future behavior, if possible and appropriate. In my more than three decades of legal experience, I know that incarceration is not always a better solution when rehabilitation is a real and viable option. Having a productive and contributing citizen is much less expensive than financing an inmate. It is remarkable to me that the current District Attorney has no program similar to, and in conjunction with, law enforcement's efforts through School Resource Officers to have a direct connection and partnership through school officials at the 171 schools in this county. Such a program would assist in fostering a connection between law enforcement, students, parents, teachers, teacher's assistants, administrators and the office of the District Attorney. Our children's first introduction to the function of law enforcement and our Justice System should be well before they are introduced to it as a defendant. That process of connection would occur in my first week in office. Wake County is home to one of the largest populations of those who have served our country in the armed forces in the entire state. That we do not have a "Veteran's Court" already in Wake County is a travesty. Rather than complain about lack of funding, I will begin a resolution program for Veteran's in Wake County the first week I am in office. Many of the criminal cases awaiting resolution stem from mental health and substance abuse issues. By engaging the services of mental health and substance abuse professionals to assist with the resolution of these matters and issues, I plan to reduce the number of cases being prosecuted and, instead, see those defendants receive the help they need in an alternative resolution program or setting. I'M THANKFUL FOR OUR VOLUNTEERS. Successful political campaigns depend on grassroots volunteer efforts in order to win on Election Day. I couldn't be more thankful for the support of volunteers so far, but need more help. Will you sign up to volunteer today? Paid for by John Bryant for Wake DA.